D.B. 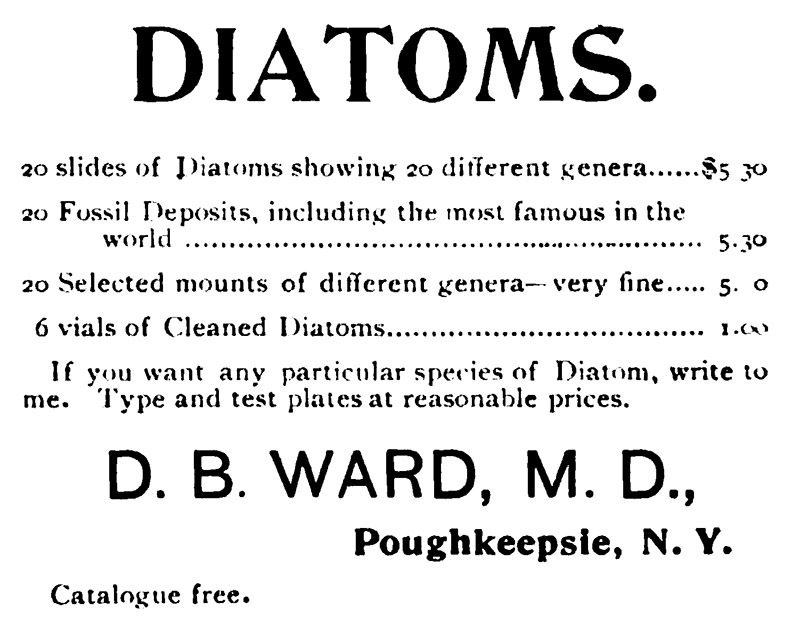 Ward, M.D., was a physician in Poughkeepsie, New York, USA, and an expert in identifying and mounting diatoms. He began advertising commercial sales of mounted diatoms in late 1890, although had been advertising to exchange his slides for at least a year before that. Those 1889 exchange offers were for “slides of selected diatoms”, indicating that he already possessed the skills necessary for picking out and mounting individual diatom frustules, and suggesting that he had then been working with diatoms for several years. Ward offered both pre-made slides, and custom mounts from his clients’ gatherings. He also provided photomicrographs of diatoms, and identified species in gatherings on request. I located exchange offers and sales advertisements through the middle of the 1890s, ending in 1895. Figure 1. A commercial preparation by D.B. Ward, of a selected Asterolampra marylandica. Known advertisements indicate that Ward produced slides for sale or exchange between 1889 and 1895. David Ward was born in Poughkeepsie on March 13, 1853, the first of three children. His father, Alson, was a banker. David received his medical degree in 1879 from the New York College of Physicians and Surgeons (now part of Columbia University). He then returned to his parents’ home and took up medical practice. Ward presumably learned to use a microscope in medical school, if not earlier. The origin of his expertise in diatoms is not known. He was a recognized expert by the late 1880s, both as a microscopist and as a photographer. For example, Lewis Woolman’s 1889 paper on “Geology of artesian wells at Atlantic City, N.J.” thanked “Dr. D.B. Ward of Poughkeepsie, N. Y., for photo-micrographs of (diatoms) which have aided the author in their study”. 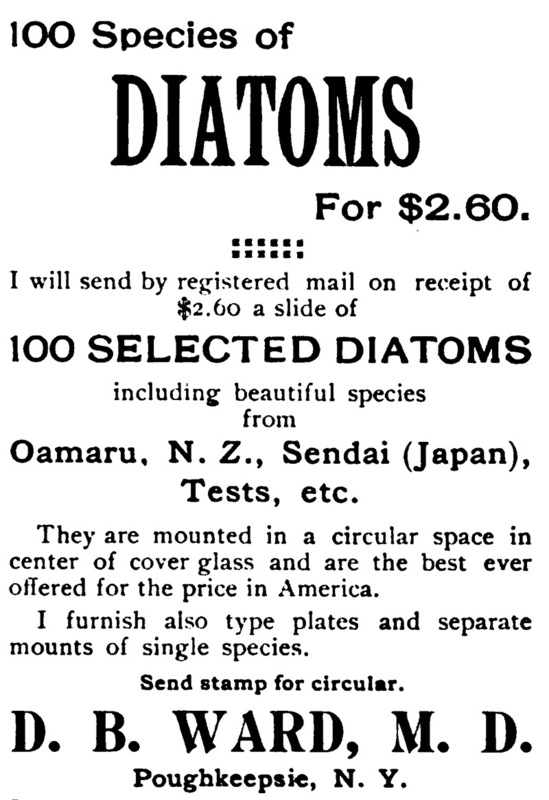 Offers to exchange slides of selected diatoms appeared by 1889, and sales advertisements were published by December, 1890. Both advertisements and exchange requests for new material were frequently published for several years thereafter. A good salesman, Ward received journalistic goodwill in return for giving samples to editors. For example, this note from The Microscope, 1891, “To Dr. D.B. 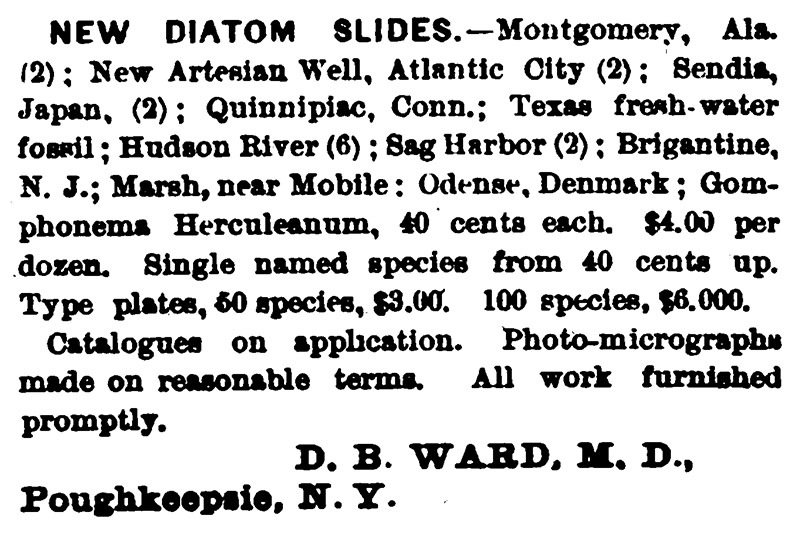 Ward, Poughkeepsie, N. Y., for three superb slides of Diatoms: Aulacodiscus Rogersii from Barnegat, N.J., Coscinodiscus subtilis from the Hudson river, and Anthodiscus floreatus from Oamaru, N.Z. The Diatoms are mounted on the cover and surrounded by a little ring of cement so that the microscopist can find them with no loss of time. The Aulacodiscus is perfection, even to the three or four marginal apparently tubular processes, their presence unbroken being an evidence of great care and skill in the manipulation”. A Postal Microscopical Club was begun in the U.S. in the mid-1890s. Similar to that of the U.K., the club mailed boxes of slides to subscribers, who had a period of time to examine the specimens, then post the them on to the next member on a list. A published description on the first box of 1894 included, “Slide No. 1, by M.A. Booth, is a well known object, the wing of a mosquito. Few have seen it in such perfection as here. It is a marvel of delicate manipulation, almost every scale on the edge of the wing being in situ. There is also attached a fine photo-micrograph by Dr. D.B. Ward, which is so beautifully clear that one has no need of a microscope for this slide”. In 1894 and 1895, Ward presented lectures to the nearby Vassar Brothers Institute, on “Diatoms” and “Bacteria”. Soon afterward, he became the Poughkeepsie City Bacteriologist, responsible for assessing purity of drinking water and other sanitation controls. A published study on water quality in Poughkeepsie included this remark, “In 1895 eight bacteriological examinations were made by D.B. Ward, M.D., of Poughkeepsie, from April to December”. Another noted, “After 1897 specimens of water, filtered and unfiltered, were sent to Dr. David B. Ward, who was then the only bacteriologist here, and one of the best of his time”. I have not located any advertisements for slide sales by Ward after 1895. It may be that his duties as City Bacteriologist did not allow sufficient time for that side business, or it may be that he no longer needed the supplemental income. His 1907 death was announced in The Journal of the American Medical Association, “David B. Ward, M.D. College of Physicians and Surgeons, New York, 1876; city bacteriologist, Poughkeepsie, N.Y., died at his home in that city, January 24, after an illness of a few days, aged 53”. Ward’s personal collection of diatoms was acquired by Robert Hagelstein (1870-1945), who later donated it to the New York Botanical Gardens. Slides from Ward’s collection, possibly coming from the Hagelstein collection, are occasionally seen in private collections. Figure 2. An 1889 exchange offer from D.B. Ward. From “The American Monthly Microscopical Journal”. Figure 3. 1891-92 advertisements, from “The Microscope”. Figure 4. An 1892 advertisement, from “The Observer”. Figure 5. An 1893 advertisement, from “The American Monthly Microscopical Journal”. Figure 6. An 1895 advertisement, from “The Observer”. Figure 7. An 1895 advertisement, from “The American Monthly Microscopical Journal”.